Video footage of the investigation can be found here: https://youtu.be/KV94VVG2MEE Animal welfare group, Viva! Campaigns have released disturbing footage taken inside Hogwood pig farm, a supplier of supermarket giant Tesco. The footage exposes shocking scenes of animals suffering from severe distress and shows one pig being eaten alive. The farm carries the Red Tractor seal of approval, an industry body who claim to ‘promote clearer labelling and ensure food originates from trustworthy sources’. Sadly, this isn’t the first time this farm has been in the limelight. Last year, Viva! Campaigns’ undercover team hit the headlines by exposing shocking conditions at Hogwood pig farm in Warwickshire where they discovered severe overcrowding, pigs covered in excreta, barren, filthy conditions, animals abandoned to die, cannibalism of corpses left to rot amongst the living and decaying piglets were engulfed in a sea of writhing maggots. Following this report Viva! Campaigns demanded Tesco stop using this farm as a supplier. Despite the damning evidence, public pressure and over 300 demonstrations organised by Viva! 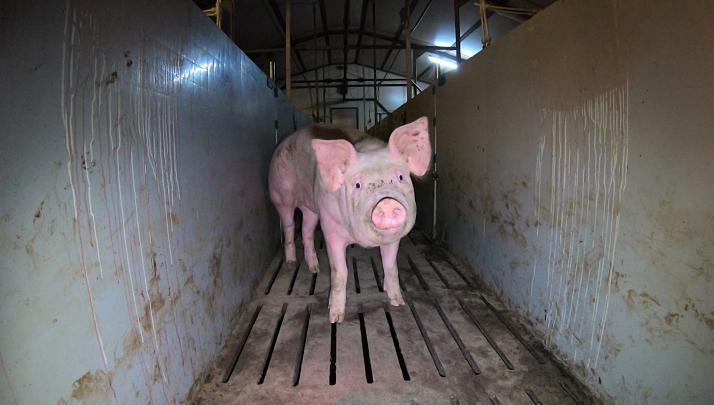 Campaigns outside their stores nationwide in 2017, Tesco refused to drop Hogwood farm. They publicly denied that the farm had any failures and vowed to continue buying meat from the farm, claiming they were happy to continue using Hogwood as a supplier. Their blatant denial of hard evidence questions the integrity of Tesco and their identity as a trustworthy consumer brand. Failure to acknowledge the incidents discovered at Hogwood farm also raises the question of how closely organisations such as Red Tractor, Tesco and APHA work together to conceal the truth about our country’s farming industry. An industry which is worth £8.2 billion yet is shrouded in a web of lies and smokescreens. Following a tip off that conditions had not improved, Viva! Campaigns decided to revisit the farm in July 2018. Once more, the team discovered animals dumped in a gangway with no access to food or water with no escape, filthy barren sheds and a complete disregard for animal welfare. Trapped in a gangway, beneath a mass of pig bodies lay a blood bath where one living piglet was being cannibalised. Investigators reported their findings immediately to the RSPCA and local police explaining the clear breach in animal welfare. After some persuasion the RSPCA called a local vet to the scene, a cattle specialist who freely admitted having no experience in dealing with pigs. Viva! Campaigns have since requested a full veterinary report from the RSPCA but to date have not yet received any response pertaining to the incident of cannibalism or the welfare of pigs more generally inside Hogwood farm. Viva! Campaigns’ most recent footage has been submitted to APHA, only to receive their generic reply which states that they take all reports seriously and will endeavour to investigate further. Viva! have submitted countless reports of unnecessary suffering and cruelty to APHA on a range of British farms, each one authenticated with dated images and a written summary of the findings. Despite providing indisputable evidence of animal welfare issues, APHA rarely respond to Viva!’s reports. At best, they acknowledge receipt of the information but never anything more. Founder and Director of Viva!, Juliet Gellatley, explains the importance of this investigation: “Our initial investigation showed pigs so tightly crammed into a disgustingly dirty industrial unit that it was hard to walk through them. Many were covered in lacerations and all were smeared in filth. Mothers were kept in crates, forced to birth on cold concrete floors with no space to move or interact with their young. “Despite the overwhelming amount of damning evidence exposed at Hogwood in 2017, both the government and regulatory bodies overseeing the industry have failed to issue any sanctions to this farm. There have been no repercussions for the people who are keeping these animals in such horrific conditions. “Our second investigation shows that Hogwood farm is contemptuous towards animal welfare; with pigs kept in filthy, barren conditions and injured and ill pigs still being left in a gangway with not even a blade of straw for comfort. One little piglet at the bottom of the heap was visibly shaking – she was being eaten alive! Her hind legs were injured and bloodied and the blood was smeared over walls and floor. Other pigs were biting at the exposed flesh. It must have been excruciatingly painful and the look on her face will live with us forever. She was making no effort to escape – there was nowhere for her to go – and so all we could see was her absolute and total dejection and pain. It was mortifying – something none of us ever want to see again. “What purpose does the government’s legislation serve if it cannot protect animals in farms such as this? The blatant lack of concern from Tesco has demonstrated they do not practice what they preach and their consumers should take heed that this farm will not be an isolated case, if Tesco are happy to buy from this hell- hole, where else are they buying from? Unfortunately, these conditions echo the lives of most pigs in Britain (and elsewhere), who endure short and brutal lives on farms where their welfare is of far lower importance than production. In light of the shocking investigation at Hogwood, Viva! asks that Tesco takes action against these atrocities and stops buying meat from this farm. It is their duty to their consumers to whom they say “We take animal welfare extremely seriously”. Despite the abhorrent findings of Viva! Campaigns at Hogwood and the ignoring of reported cruelty and neglect the public is still being spun the line that we have the ‘best animal welfare in the world’. The sweeping under the carpet of animal cruelty and abuse can never be justified, and it must end.